Apple has launched an urgent safety probe into its iPhone 5 amid claims a bride-to-be died from a massive electric shock while answering a call in China. 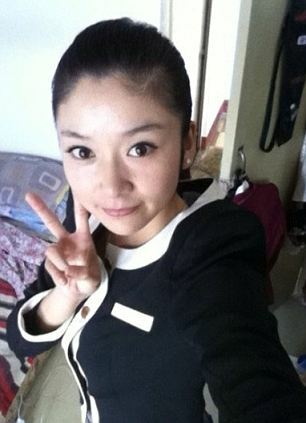 Ma Ailun, a former flight attendant with China Southern Airlines, collapsed to the ground when she picked up her smartphone as it charged at home on Thursday, her family said. The 23-year-old, who was planning to wed on August 8, was rushed to hospital in Xinjiang, northwest China, but medics were unable to revive her. She said Ma had bought the iPhone in December at an official Apple store and was using the original charger to recharge the phone when the incident occurred. 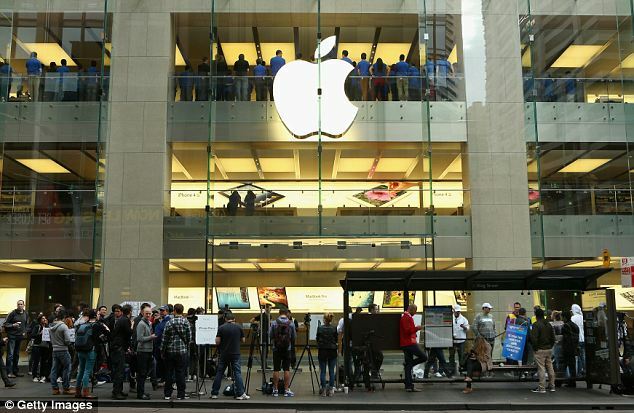 Apple, who manufactures the state-of-the-art smartphone, said it had launched a ‘thorough investigation’, adding: ‘We are deeply saddened to learn of this tragic incident and offer our condolences to the family. Apple’s mobile gadgets have a generally good safety record with few serious defects reported since the first generation iPhone was launched in 2007. However, as smartphones become more powerful, with larger batteries needing more electricity to power them, there have been growing reports of dangerous malfunctions that have dogged the firm in recent years. February 2013 – Marketing manager Shibani Bhujle, from New York, claimed the battery of her iPhone 4S spontaneously melted, oozing acid that destroyed the handset. January 2013 – An Oregon fire crew blamed an apartment blaze on an overheated MacBook battery which dropped onto a mattress. 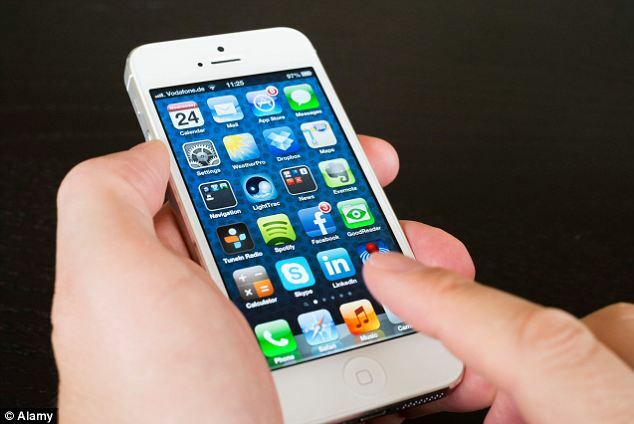 December 2011 – An iPhone 4 reportedly began emitting smoke in a plane cabin on a flight to Australia. December 2011 – It was reported that an iPhone 4 was plugged in to charge overnight in Brazil when it began to emit smoke and sparks as its owner slept nearby. November 2011 – Apple recalled all iPod Nanos amid fears the batteries on older models were prone to overheating and catching fire. In 2010, a man in northeast China was killed by an electric shock when making a phone call with a handset that was being recharged with an unauthorized charger, according to the China Consumers Association. In 2008 a 3G owner claimed his phone overheated in his pocket and burned his leg while he was asleep. But Apple is not the only smartphone maker to have come under fire for faulty gadgets. Just last week, a Swiss teenager suffered second and third degree burns when her Samsung Galaxy S3 apparently exploded in her pocket. In May, a Reddit user posted pictures on the site of his charred Galaxy S3, claiming he was ‘awoken by a loud noise and a weird squeaking sound’ to find it smouldering by the side of his bed. China’s popular social media chat sites, called Weibos, were flooded with posts urging fellow iPhone users not to make calls while charging their phones. And many warned to only use original chargers and avoid plugging in cheap copy chargers which are widely available. ‘Be sure to select only qualified, certifiable products – the best is the original because safety is most assured. Don’t buy fake chargers!’ warned poster Zhao Chao. Apple products are popular in China but new items are quickly cloned by the country’s infamous copy merchants who produce look-a-like fake phones, laptops, iPads and iPods, which are often hard to distinguish from originals. Mobile phones have a relatively low electrical output of between 3 to 5 volts – much less than the 36 volts it takes for a person to feel a shock. But experts say if the charger or the circuit has a problem, such as a broken wire, it can lead to a shock of 220 volts. 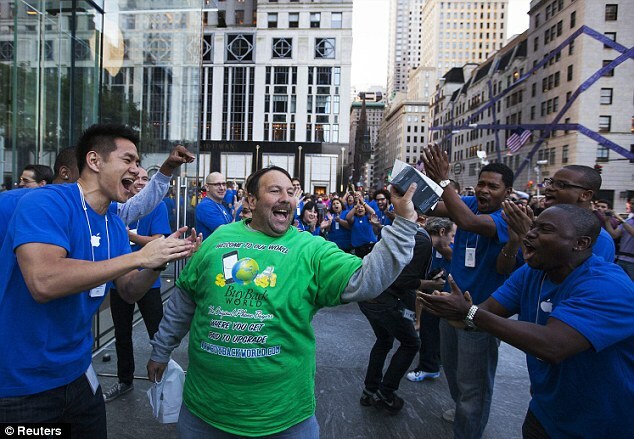 The iPhone 5’s much-vaunted launch last September saw thousands of Apple fans queue for days outside Apple stores across the world to be the first to get their hands on the state-of-the-art gadget. Grinning customers were greeted with cheers and high fives from staff as they walked into stores ready to grab the latest hotly-anticipated smartphone. It costs between £529 and £699 in the UK and $199 and $399 in the US, depending on the amount of memory, has a larger screen and is lighter and slimmer than previous models. 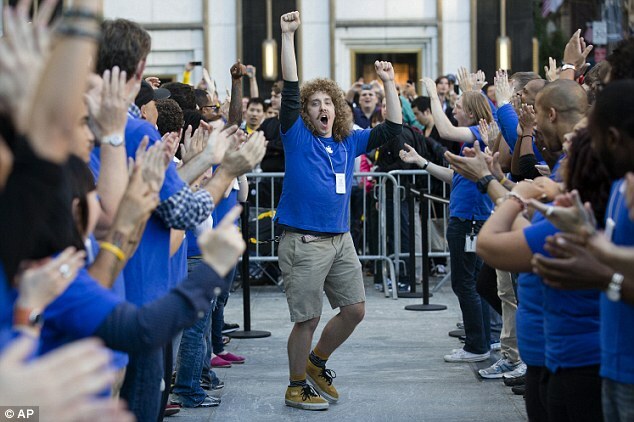 The news comes as it was revealed today thatApple has fallen off the top ten list of best-perceived brands in 2013. 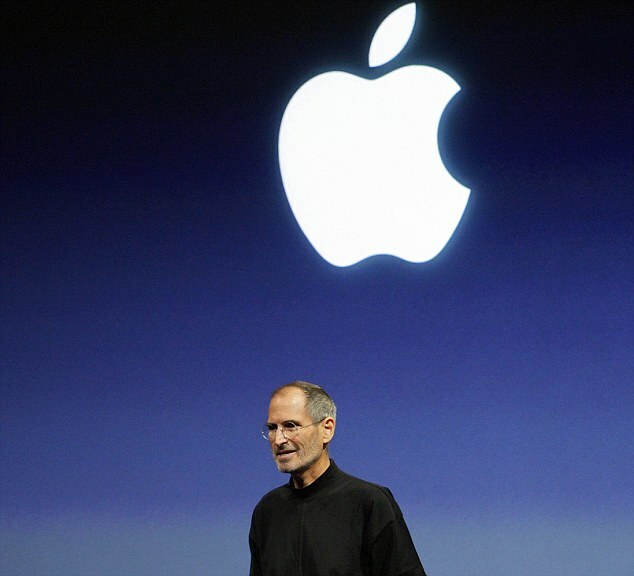 The tech firm – known for its trailblazing innovation – lost its charismatic front man Steve Jobs in 2011 and then faced a chorus of disapproval over allegations of child labor in its supply chain, not to mention long-reported harsh conditions in its Chinese factories. Most recently, the brand was convicted on Wednesday of conspiring to raise and fix the price of e-books in an attempt to dominate the market leader, Amazon.